Close your eyes and imagine that you are sitting on a warm, sunny beach, the gentle waves breaking a few yards in front of you. A cooling breeze brushes over your body as you sip a refreshing cocktail. There is a steel drum band playing somewhere behind you, filling the air with addicting calypso rhythms. You smile, feeling the bliss that comes with complete relaxation. Have you ever visited the Caribbean? I was lucky to have the opportunity to take a cruise and experienced several different islands with their unique characteristics and histories. I think my favorite was St. Martin/St. Maarten, a fascinating island that is half French and half under Dutch rule. They are completely separate countries and making a phone call from one side of the island to the other is an international call! One of my favorite meals was in a tiny shack on the island of St. John. We sat on the patio and sampled some of the freshest and best tasting fish I had ever eaten. It was the first time I had tasted the creative blending of herbs and spices so common in Caribbean cooking and I was smitten. I fell in love with the people, music and foods of the islands and am still enchanted today. Caribbean cuisine is a fusion of African, European, North and South American, East Indian and Chinese influences. Each conquering nation brought their own styles of cooking and ingredients, layering those on top of existing traditions, creating a captivating explosion of flavors. One of the most often replicated styles of island cooking is Jerk, a spicy highly seasoned blend of ingredients that often include allspice, salt and pepper, habanero peppers, and thyme. You can easily find pre-made spice blends in most grocery stores these days or of course you can make your own. Jerk evolved as a natural way of preserving meats in the tropical heat. Today’s recipe is a fun way to help recapture the flavors and slow pace of the Caribbean. 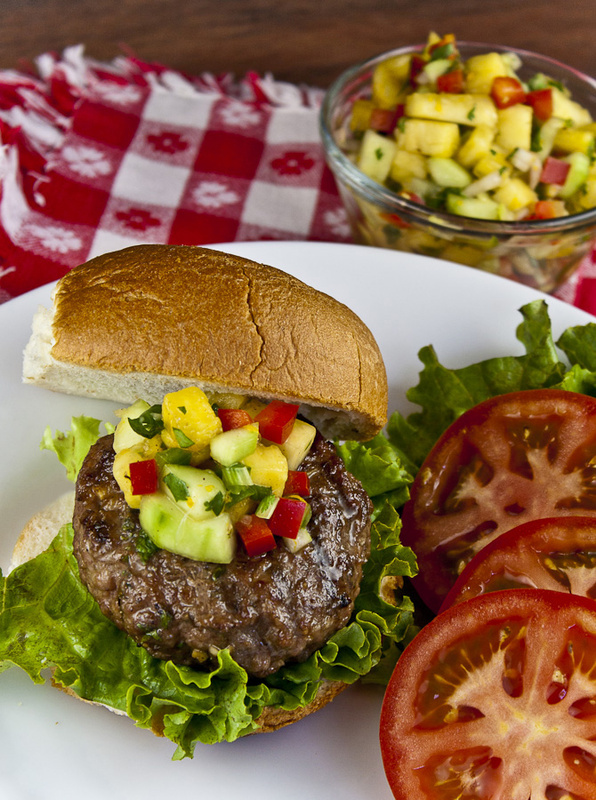 I used a store-bought jerk blend to season the pork burgers and served them with a beautiful and tasty pineapple salsa. I made my burgers with ground pork (not sausage), but you could use any ground meat you prefer such as beef, chicken, veal, or turkey. During the hot summer days, this is perfect for keeping your kitchen cool because the entire meal can be made on your barbecue. Grilling the fruits and vegetables that go into the salsa adds a wonderful smokiness that complements the pork burgers. You can also make the salsa with completely raw ingredients if you prefer. While mango is more common in the islands, pineapple was easier for me to find in my area. You can use either in this refreshing condiment. Have you seen Char-Broil’s new Smoker Boxes? These ingenious little disposable foil containers are filled with wood chips and have a perforated top. Cooking on a gas grill now gives you all the flavor of cooking over wood with none of the hassles or dangers of the open flame. You drop one of these boxes on the back of your hot gas grill and it generates enough smoke to season your entire meal with no fuss or bother. You can choose from hickory, mesquite, alder, apple, cherry, and maple. Contrary to what we grew up with, you no longer have to cook pork to death. Medium is perfect for these burgers – nice and moist! I know that hamburgers and hot dogs are common fare for summertime cookouts, but give your guests an unusual choice and add these spicy burgers to your menu. I bet they’ll be the first ones gone! Enjoy your summer grilling and have a wonderful weekend! Preheat grill to medium-high. If using charcoal, set up a medium-hot fire and pile the coals on one side of the grill. Make the Salsa: Brush the pineapple pieces lightly with the oil and carefully place on the hot grill. Cook until they develop grill marks, turning as needed to avoid burning. Use tongs to transfer them to a bowl as they are done. Add the bell pepper slices to the grill and lightly cook them just until slightly softened and smoky. Remove from the grill and add to pineapple pieces. Chop the pineapple and peppers and transfer to a medium glass bowl. Add remaining salsa ingredients, tossing to combine. Taste and adjust seasonings. Cover and refrigerate to let the flavors blend. Return to room temperature, taste and adjust seasonings again before serving. Make the Pork Burgers: In a large bowl, combine the ground pork, soy sauce, shallots, garlic, thyme, and jerk seasoning. Start with a small amount of the jerk seasoning if your family prefers mild foods, you can always add more later. Use your hands to evenly distribute ingredients. Pinch off a small piece and cook it in a small skillet until cooked through. Taste it and add salt and pepper as needed. Add more jerk seasoning if you want your burgers spicier. Gently pat the pork into 3 patties, compressing them just enough to hold together and pressing your thumb in the center to create a slight depression. Place them on a parchment-covered plate and chill for 15 minutes. This will help them hold together on the grill. Use a spatula to carefully transfer the patties to the hot grill, adding more charcoal if needed. Cook without moving until you get grill marks, about 3 to 4 minutes, and then carefully flip the patties to the opposite side. Cook until the interior temperature reaches 150°F to 155°F, another 4 to 5 minutes depending on the heat of your grill. Transfer the patties to a clean platter, tent lightly with foil and set aside while you finish your preparations. The internal temperature will continue to rise as they rest, reabsorbing the liquid that has moved to the exterior of the burgers and coming to their final temperature above 160°F. For Serving: Place a lettuce leaf on the bottom half of each hamburger bun, add a burger and top with a dollop of the pineapple salsa. Replace the top half of the buns and serve immediately. This looks succulent and delectable! You’ve got me craving for this juicy burger…in the middle of the night! LOL….I better go to bed now so have have energy to get the ingredients tomorrow and make these for dinner. Hey Amy, I’m sorry for making you hungry in the middle of the night, but glad to give you an idea for your dinner plans!! Hope you enjoy these as much as I do! !